Back in April, DraftFCB brought new attention (and over 20 million YouTube views) to Kmart with the double-entendre filled ‘Ship my Pants‘ TV commercial. That was followed shortly by the similarly themed ‘Big Gas Savings’ ad and the more recent Joe Boxer tie-in ad ‘Show Your Joe’. With the holidays in full swing, Draft FCB has brought back ‘Ship My Pants’, but with a Charles Dickens twist as ‘Ship My Trousers’. 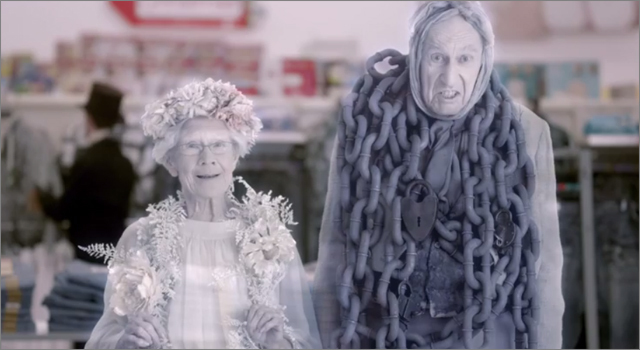 The same actors from the original commercial are now dressed in period costume as characters from Dickens’ A Christmas Carol.